This article is all about Gratitude, with a capital “G”. That’s right. 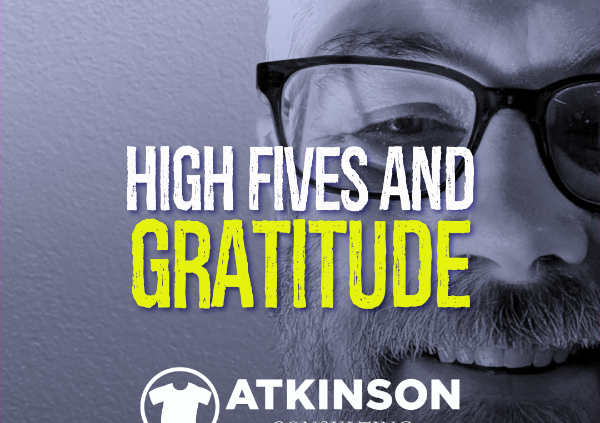 I want to give you a big High Five and Thank You for reading my blog posts, eBooks, and talking to me about your shop. 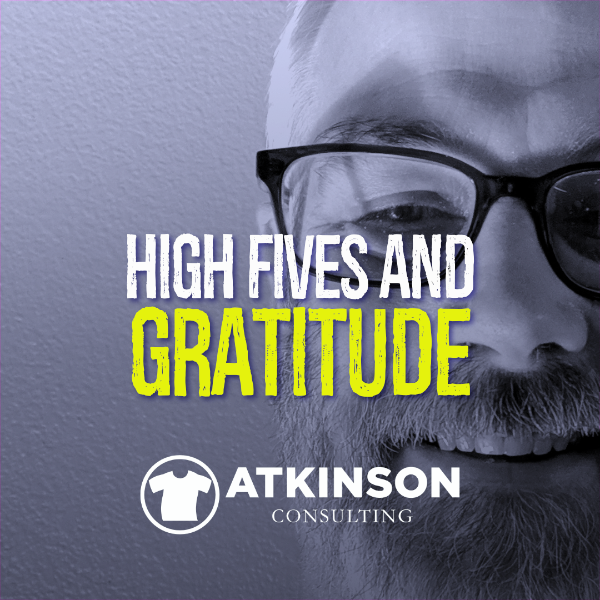 In December of 2010, I started Atkinson Consulting, and it has been a primarily a side-hustle thing for me since then. Only this year did I take a leap of faith and start coaching full time. Simply put, it’s been a great year. While I can’t name everyone, I do want to roll out some key points of appreciation to those that really stood out. Family comes first, and I’d like to say thank you to my awesome wife Jody and my son Jack. They are my biggest cheerleaders, and no victory is complete without including them. Jody is always thinking of me, and she makes my life easier is innumerable ways. She’s my best friend and I couldn’t do anything without her strength. Jack is a freshman in high school, (I know, holy cow time goes by quickly), and makes it all worthwhile. Proud Dad here. My younger brother, and someone I’ve been talking things through with my entire life. Tim always has been a great sounding board. He encouraged me early on with the development of Shirt Lab, and probably another million things this year. Late last year I called Mark Coudray and he helped me get my thinking straight and how to organize my thoughts for going out on my own. Many times I have ended a conversation with him and thought how extremely lucky I am to have him in my corner. He drills down to the DNA of problems very quickly and offers solid counsel that always not only makes sense but delivers pragmatic solutions. I’m happy to be a part of his Catalyst Accelerator program and constantly learn at the feet of the Yoda of our industry. I couldn’t ask for a better mentor. This year I wrote four eBooks, and have been thrilled at how quickly they took off. While a lion’s share of the eBooks have been downloaded and purchased by fellow Americans, many books have been enjoyed by shop owners in the UK, Ireland, Canada, Australia, Nigeria, Philippines, Ghana, Israel, Trinidad and Tobago, New Zealand, Sweden, Egypt, Mexico, Argentina, Slovenia, Czech Republic, and even China. It’s really amazing to hear from shop owners or managers how my eBooks have made an impact on how they run their shops. So if that’s you…thanks! Glad I could help. If you know me you know how I like helping people. At one point in my life, I wanted to teach high school art, so I think it is natural that at this stage in my career I’m working with people again. Some of my coaching clients I only speak with once a month, while others it’s every week. These companies aren’t limited to American businesses either, as a few are in other countries. All of them have made great progress this year and I’m thrilled to be part of their growth. These days, about once or twice a month I’m on an airplane going to someone’s shop to help with their workflow, processes, and systems. It is so rewarding to help solve challenges and be a part of positive change. I am very grateful for the opportunity to help these shops succeed. Thanks! One of my happiest moments came this year after the conclusion of our first Shirt Lab. I was with my business partner, Tom Rauen and we were absolutely exhausted. I felt like I had just won the Super Bowl. It was such a great feeling, knowing that an idea that was developed over a conversation at an industry breakfast had grown and blossomed into a business that could make a meaningful impact on the industry. Tom is such a great business partner, and we’re busy planning the four Shirt Lab events for 2019. I’m very thankful that we had such an incredible slate of industry mega-minds to help us teach at our workshop, amazing sponsors to support us financially, and a sell-out crowd of shop owners that were hungry for the sales and marketing lessons that we produced. More to come next year, so thank you very much for making our Shirt Lab idea come true! Trade publications gave me the high honor of presenting my ideas and thoughts to everyone. Below is a breakdown of articles I penned for these institutions. If you read them, thanks! Maybe you missed one or two, so here’s a good list to catch up. I have my own column in Screen Printing Magazine called “The Marshall Plan”. It has been fun to write, and I’m happy to contribute to every issue! This year I put together a series for Impressions on workflow. Each department in a shop was featured in an article with some best practice tips. Check them out below. I also wrote these articles for Impressions on some different topics. I’m a big supporter of SGIA and their mission in making everyone stronger. Here’s an article I wrote for them this year. Note: you need to be an SGIA member to access it. I’m really proud to host The Big Idea for InkSoft. I’ve tried to cover and get some great guests and different ideas out there with this podcast. When I go to trade shows or talk to shop owners for the first time, many have thanked me for this series or even one particular show. Feedback like that helps, as it adds more mojo to my tank when I’m working on this stuff. While there are only a few weeks left in the year, I’m steadily working on planning for 2019. I’ve already made some great connections with new shops to help and have started booking onsite coaching trips. Whether I’ve helped you in the past, or you believe you might need an extra push, I would love to chat with you about your shop. Nothing would make me happier than hearing your story about how you got into this crazy industry. Personally, I don’t think anyone sets out to do it on purpose. We all have backed into it one way or another. Want to chat? Click the button here and book a 30-minute call to talk about your shop. Not sure if you read every word, but that’s ok.
Like a secret Easter Egg in a video game or movie, here is your reward. Enter this coupon code for 30% off any of my eBooks. I just want to express my sincere gratitude to you for reading my blogs and allowing me to help you on your journey.